Getting a handmade card or gift on Mother’s Day from my children is one of my favorite things in the universe. The pride that shines in my children’s eyes as they hand it to me is unlike anything else and my heart explodes with joy every.single.time. 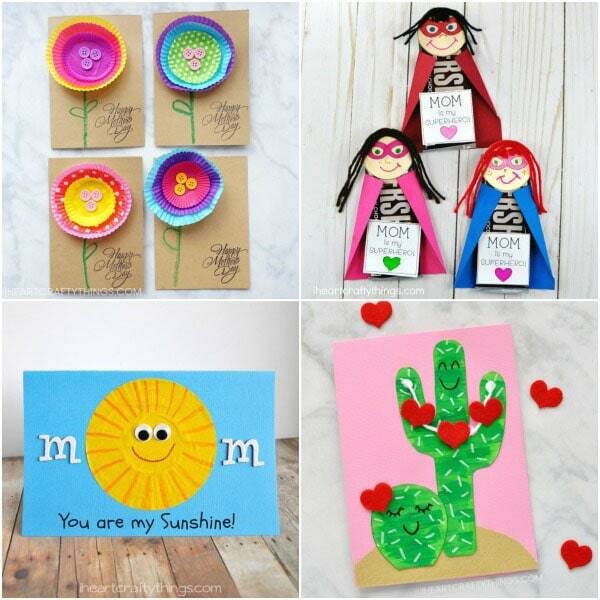 Finding simple Mother’s Day card ideas can be a daunting task though. 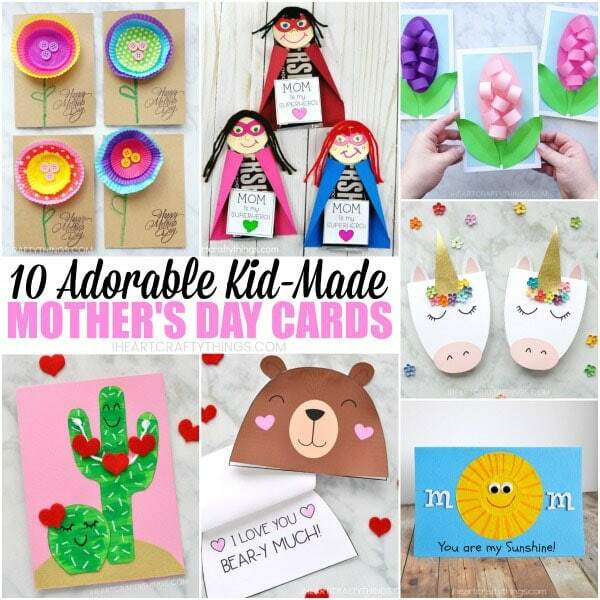 We’ve gathered a list of 10 adorable Mother’s Day card ideas that are simple enough that kids can make on their own. Whether you are looking for an easy template for kids to use or simply need an idea that even toddlers and preschoolers can create, you’ll find a variety below for kids of all ages. 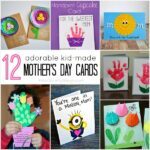 Click on the title links underneath the photo collages to be taken to the full Mother’s Day card ideas tutorials. If you would like to share this post (please do!) we would appreciate if you would use the top square image for social shares or the vertical image at the bottom for pinning. Have any leftover cupcake liners laying around the kitchen? 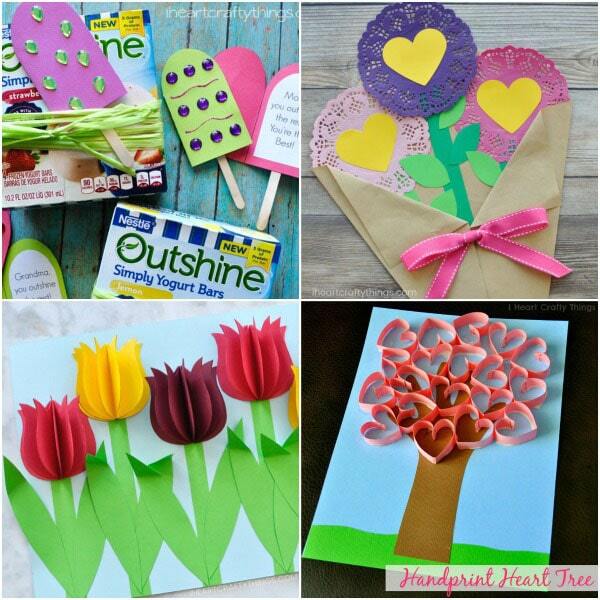 Use them to create these pretty Mother’s Day Flower Cards. Does your Mom have some serious super powers? Use the free template to create this chocolate bar Superhero Mom Card. Mom’s are great at bringing sunshine to rainy days! Here’s a simple sunshine card made out of a cupcake liner that even toddlers can enjoy creating. 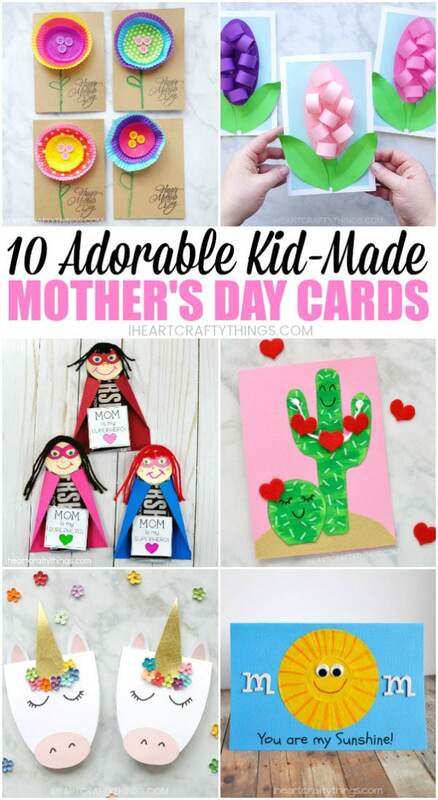 These cactus cards could not get any more adorable! Although we originally made them as a Valentine’s Day card, you can easily use the template to turn them into a pretty Mother’s Day Card. What Mom doesn’t love the color and scent of fresh spring flowers? 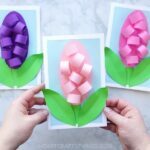 This colorful 3D Hyacinth Flower Mother’s Day card is sure to brighten Mom’s day. 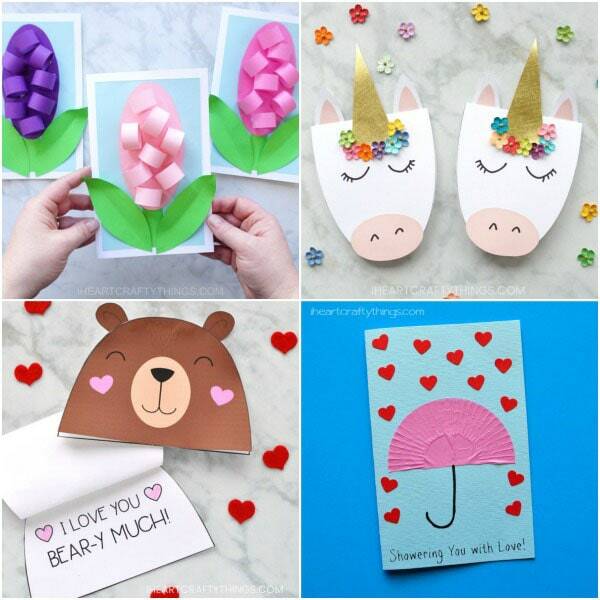 Have a Mom who loves unicorns? Use our free template to create this beautiful Unicorn Card for your magical Mom. 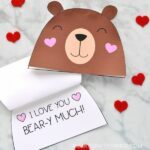 Show your Mom you love her bear-y much with these adorable printable bear cards. We have a color option available and black and white so you can easily color them on your own. Shower your Mom with love with this simple umbrella card created again out of a cupcake liner. This sweet card is a great option for little ones to create for Mom and Grandma for Mother’s Day. Here’s a unique popsicle card that goes perfectly with Mom’s favorite icy treat as a Mother’s Day gift. Kids will love customizing the front of their cards and we have a printable template to make creating the card a breeze. Have a Mom who loves flowers? Here’s a clever way to turn a sheet of paper into a simple flower bouquet gift for Mother’s Day. Fill the inside with doily flowers and add a special message on the back of the bouquet. Use our 3D paper tulip template to create a Mother’s Day card full of tulips for Mom or Grandma. You could even attach the tulip flowers to wooden skewers and place them in a vase as a handmade Mother’s Day gift. This handprint heart tree is a sweet keepsake that Mom and Grandma will treasure forever. We absolutely adore this pretty origami dress made into a sweet pop-up Mother’s Day card. Stop by our friend’s website for the easy tutorial.